WASHINGTON — As the economy of Venezuela is falling apart, protests and counter-protests show how divided the country is. Reuters reported that the supporters of the current regime, “Chavistas” who glorify their dead leader Hugo Chavez, protested the killing of a lawmaker Robert Serra from their party while a counter-protest of the opposition tried to highlight the problems the country is facing. 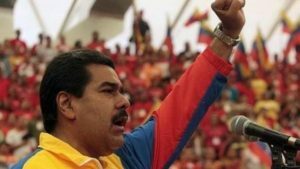 As usual, Chavez’s successor and former pupil, Nicolas Maduro, railed against the opposition and blamed “right-wing fascists” for Robert Serra’s death. He called supporters “young rebels, young revolutionaries”. The media reported that Serra’s murder was an inside job, but Maduro also blames Colombian paramilitaries. The Venezuelan opposition denies any involvement. Maduro’s rule has seen crime spike, shortages of goods like toilet paper and even wine for the Catholic Communion and a 60% inflation rate. Maduro won a highly-contested election, where the opposition accused Maduro and his supporters of stuffing the ballot boxes to guarantee his victory over opposition candidate Henrique Capriles.